An Inductor is simply a solenoide which is rounded on a core. This creates a magnetic flux or magnetic field when alternating current or A.C. Supply is given to it. Inductors are used to block some amount of current in a circuit. 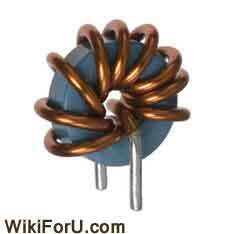 In inductors the winding is of copper wire and core is of air or steel iron. Inductance is the ability of an inductor to store energy or power in its magnetic field. It is denoted by capital L.
The units of inductance are "Henry". Inductor works on the principle of Electromagnetic induction or on the faraday's law of electromagnetic induction. Number of turns of winding. The nature of core used. Amount of current and the direction of current. When we apply alternating current to an inductor, the magnitude of current or voltage changes with time and as a result of this the direction of induced magnetic field also changes and thus oppose the current. Constant or fixed inductors are those whose value can't be changed. Adjustable inductors gives some options to change its value. Variable inductors gives higher adjustment options to change the value of inductance. Inductors have many applications in the field of electrical and electronics. They are used in Amplifiers with capacitors. They are used as filters in telephone lines. They are used as chokes which are of great use. The transformer is also a type of inductor in which we make use of two inductors.